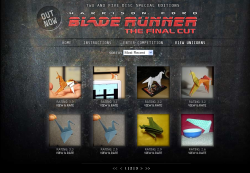 I built a PHP gallery for the Blade Runner origami competition. It was a fairly decent online gallery that allows people to upload images, see them as thumbnails, rate pictures and report inappropriate entries. The competition wasn’t entered by a lot of people (the instructions for the origami were complicated and hard to follow), but the site is still quite a nice piece of work.